February, a short month, has felt even more abbreviated this time around due to a packed calendar, a multitude of performances, a trip to London, way too much snow to shovel, and lots of other distractions. And now I'm fighting a cold as I prepare to leave tomorrow for the Kansas Silent Film Festival, to be held on Friday & Saturday, Feb. 27-28 at Washburn University in Topeka, Kansas. All I can say is, "Woof, woof!" But out of chaos can come extraordinary things. And into that category I must put a screening of 'J'Accuse' (1919) this past Sunday night at the Harvard Film Archive. The film, a three-hour Able Gance epic, was part of the HFA's ongoing series exploring World War I as depicted in the movies. I was thrilled to be asked to accompany 'J'Accuse,' a film I'd never done before. But the screening happened to be on the same day I was scheduled to return from London. Was it wise to try accompanying a three-hour epic after just getting in from a trans-Atlantic flight? Do you think I even asked that question? Programmer David Pendleton was a bit dubious about bringing me in under the circumstances. But let me do it, and I'm glad he did! 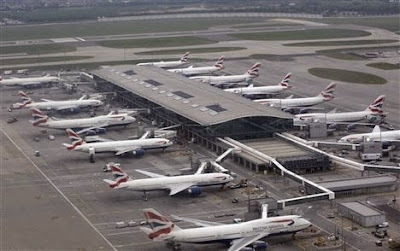 However, getting to the HFA on time became a worry when we became stuck for more than an hour on the tarmac at Heathrow in London due to a baggage issue. Stuck on the tarmac at Heathrow's Terminal 5. We arrived in Boston just before 3 p.m.—more than an hour late. To get back home to New Hampshire and get my digital keyboard, I had to make a 3:25 p.m. bus. Standing in a long slow-moving line for customs, I figured I'd missed my ride. So I was already mentally preparing to head over directly to Harvard and try my best using their acoustic piano. But by some miracle, I made the bus, got home, loaded the synthesizer and gear, and then drove an hour back down to Boston, arriving at the HFA just as the prior screening was finishing up. I don't know if this steeplechase-like journey was a contributing factor, but I felt the music I came up with for 'J'Accuse' was very satisfying and effective. I used two basic themes: one new, but based on the same chord structure as 'When Johnny Comes Marching Home,' and another that I created last year for a screening of the Italian epic 'Cabiria' (1914). Not having seen the film, I was surprised a few times by Gance's rapid cutting and unexpected transitions. But the film was easy to follow and everything came together quite well, I thought. There were some big moments and I think I caught most of them. One handicap I was working under was that in London, I had caught a cold. And so on the flight home, my ears got all screwed up. When we landed in Boston, my ears did not get un-screwed up, and so it was difficult to hear what I was doing in full fidelity. And it didn't help that somewhere in the middle of Part 1, we lost one of the output channels. Thankfully, projectionist John Quackenbush was able to restore the channel for the remainder of the film. So could I have done a better job if I'd spent a lot of time preparing? Or if I hadn't been on an eight-hour flight? Maybe. But between you and me, I'm not really sure. Sometimes circumstances conspire so that everything comes together in a certain way. In the case of 'J'Accuse,' the experience began way back in 1919, when Abel Gance made the film. In contrast, my contribution was all at the last minute, and in real time and under less-than-optimum circumstances. Not only had I not seen the film, but was accompanying it after a long trans-Atlantic flight that same day. So it was a unique combination of something made long ago and something being made right in the moment, never to be repeated exactly the same ever again. And that's one of the things that I think will help the art form of silent film remain of interest: the films themselves may not change, but the music performed with them can differ every time. Tomorrow morning it's off to my 16th consecutive annual visit to the Kansas Silent Film Festival, held each year at this time on the campus of Washburn University in Topeka, Kansas. Just as February has gone by fast, I can't believe I've been present at this event for enough years now for a newborn to get a driver's license. I return for many reasons, to the point where it's really become automatic. In February, some people in New England escape to Aruba. I escape to Topeka. I'm really looking forward to this year's edition because Jon Mirsalis is being brought in as guest accompanist and speaker. I admire Jon's scoring technique and always learn stuff when I get to hear him play live. What a treat to have him doing music for several features, including part of Griffith's 'Birth of a Nation' (1915) and 'The Seahawk' (1924). Full report afterwards...and then it's on to a busy March: multitudes of screenings, a trip to Cinefest in Syracuse, N.Y., and probably lots more snow to shovel before this winter is over. 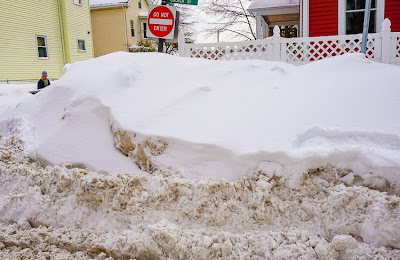 Not even snowpiles like these in the Boston area could stop silent film! Pleased to report that we went three for three this weekend. Despite the latest in a series of snowstorms that are collectively burying New England, all three silent film screenings went on as scheduled. 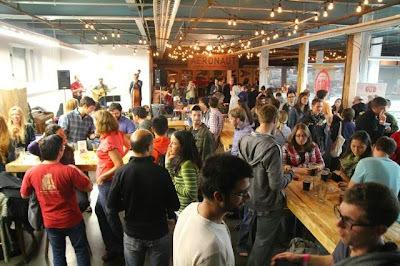 The Aeronaut on a crowded night. We staged the silent film in the area way in the back. • A Valentine's Day program at the Aeronaut Brewery in Somerville, Mass. attracted a hardy band of the curious (average age maybe half that of mine) who reacted explosively to Buster Keaton in 'Seven Chances' (1925). Alas, the Saturday night brewery crowd was noticeably thinner compared to my first visit. Blizzard conditions had taken their toll. But still, there was a good vibe in the place, which features an eclectic line-up of live entertainment. When I arrived, a small combo (I think it included a sousaphone) was playing an arrangement of one of the Gershwin piano preludes while a young woman did interpretive dance on the brewery floor. And this was followed by some silent film thing! But come showtime, people began moving over to where I'd set up the keyboard, speakers, and projector, packing in around it in chairs and tables. By the time we started, it was a good-sized audience. And, as I soon found out, a very responsive one! You know it's going to be a fun ride when even the opening sequence (in which Keaton repeatedly fails to propose to his beloved) produces gales of laughter. And after that, it just never let up. People were really into it. And I didn't ask, but I have to think that most people there had never experienced a silent film that way: with live music, and as part of an audience. So, as we all discovered, what's old can be new again. And it was very gratifying to see it all come together so successfully. I have to say, it ranked as one of the best silent film experiences I've had in all the years I've been doing this. My thanks to Christine Platzek, Ben Holmes, and everyone at the Aeronaut Brewery for taking a chance on silent film. Even in the midst of a blizzard, it worked out great! • Alas, only about a dozen people showed up for a matinee screening of MGM's 'Love' (1927) on Sunday, Feb. 15 at the Wilton Town Hall Theatre. 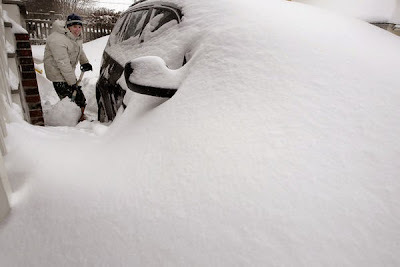 And that wasn't surprising, as the region was still digging out from another foot of snow, plus contending with Arctic temperatures and winds of 50 mph. Theatre owner Dennis Markaverich didn't run his usual Sunday shows at 2 p.m., as no one showed up and he was too busy unburying the theater. But we went ahead with 'Love' at 4:30 p.m., and it seemed especially fitting that the film starts in a howling blizzard! This isn't one of the immortal silent classics, which I confided in the small group on hand. MGM basically took a steamroller to Tolstoy's sprawling novel 'Anna Karenina,' boiling it down to a series of scenes that would give maximum face time to Greta Garbo and John Gilbert. The fact that they threw out just about all of the novel, and then also changed the conclusion to a happy ending, wasn't a concern to the studio. It was designed with one aim: to sell tickets, which it did. 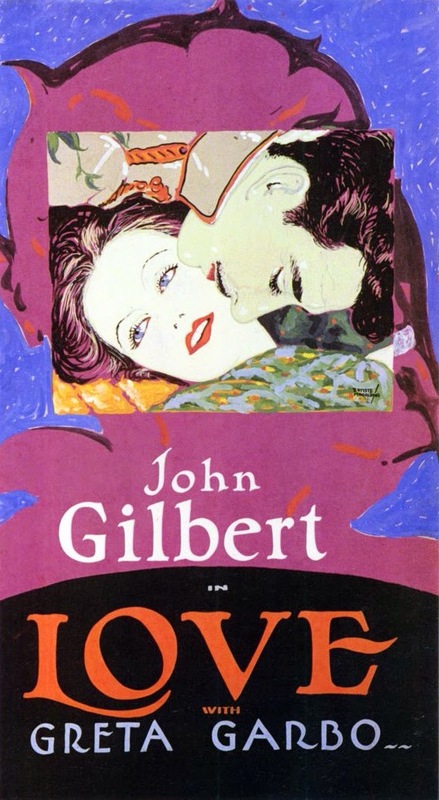 However, 'Love' was produced at the very height of the silent film era. Also, it was made by MGM, at the time the most technically slick studio in Hollywood. So despite some shortcomings, it contains a lot of interest—sequences that show silent film at the peak of its eloquence. In previewing the film, I was struck how several intense "dialogue" scenes (where Garbo and Gilbert speak passionately to each other, at some length) are presented utterly without any intertitles. It's not like 'Love' avoids intertitles. They're used frequently elsewhere. But in some places, we're left to just watch the faces and the expressions, even as quite a lot is being said, sometimes quite passionately. I think this is one key to the unique power of silent film. By not getting the details, we're left to imagine what's being said. And that leaves us free to imagine something more intense and personal, perhaps, than could be concocted by any title writer. By letting us do the work, if we care to, the film absorbs us and draws us in more closely to the characters and the story. That this is done in a fairly routine (if high profile) release such as 'Love; shows how pervasive this method of presenting a story had become. As the motion picture matured, filmmakers were pushing the technique of visual story-telling in surprisingly abstract directions. We followed 'Love' with this. Seems fitting, somehow. • After 'Love,' I raced down snow-covered highways to the Somerville Theatre (just outside Boston, Mass.) to do live music for 'The Cabinet of Dr. Caligari' (1920). This screening was part of the annual Boston Sci-Fi Marathon, held every President's Day weekend and now in its 40th year. For 24 hours (yes, straight without a break), about 500 hard-core fans take in a continuous diet of big screen sci-fi flicks of all types—the good, the bad, the very bad, with sometimes even a silent thrown in. I'd been here before, in 2011, when I did live music for the 1916 version of '20,000 Leagues Under the Sea.' Not sure how 'Caligari' qualifies as sci-fi, but I was thrilled at a chance to do live music for it at the "'Thon," as attendees call it. One reason is that it's a chance to bring a silent film to life for a large audience that's quite separate from the usual silent film crowd. Somerville was absolutely buried in snow. But despite a parking ban and no public transit, the "Thon" went on as planned, although the start was pushed back from noon to 4 p.m. Attendance was strong: I arrived just as the main theater's doors burst open at the intermission of '2001: A Space Odyssey,' and was surprised that the place was packed! Set-up required me to gingerly step around people who'd camped out (sleeping bags and all) in the area below the stage, but everyone was really nice about it. 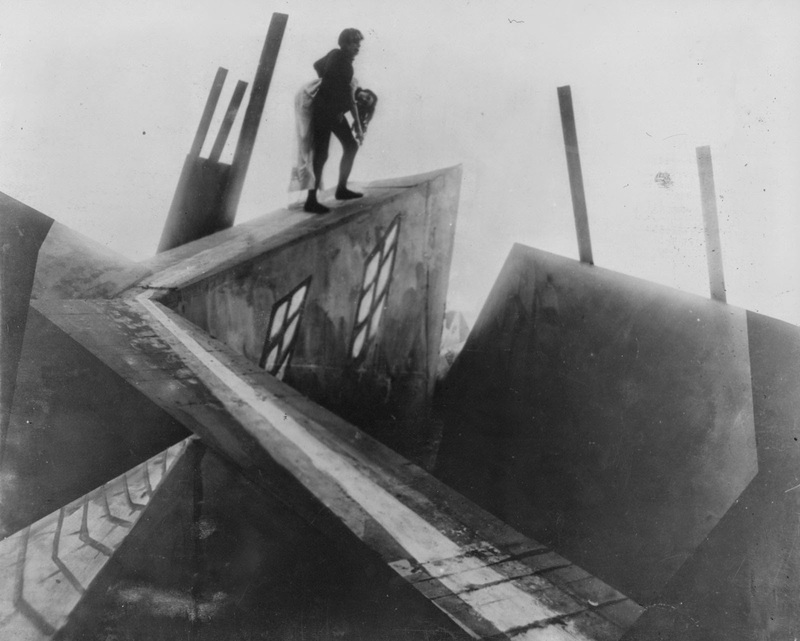 'Caligari' was preceded by a Thon tradition: the alien tinfoil hat contest. And after that, we went right into Caligari, shown in DCP. Projectionist David Kornfeld thought the transfer was too slow, but it seems to flow all right in terms of the music. The only special effect was that I brought my grandmother's old brass school bell to ring during the three times that Caligari is seen ringing a bell to get attention for his carnival act. Great ovation at the end! Hope to do it again in years to come. And then I went out in the cold to start my car, and the Thon moved on without me. 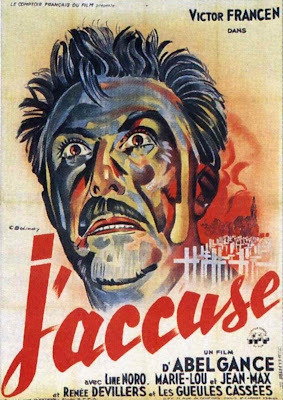 • Last-minute addition to the schedule: I'm doing music for Abel Gance's 'J'Accuse' (1919) on Sunday, Feb. 22 at 7 p.m. at the Harvard Film Archive, 24 Quincy St., Cambridge, Mass. For more info, please click the link. I just was asked to do this, so haven't had a chance to prepare much. And I'm leaving for London tonight, returning to Boston the afternoon of the screening. Cutting it close, I suppose, but I'm game. And then after that, it's off to the Kansas Silent Film Festival on Feb. 27 & 28 in Topeka, Kansas. 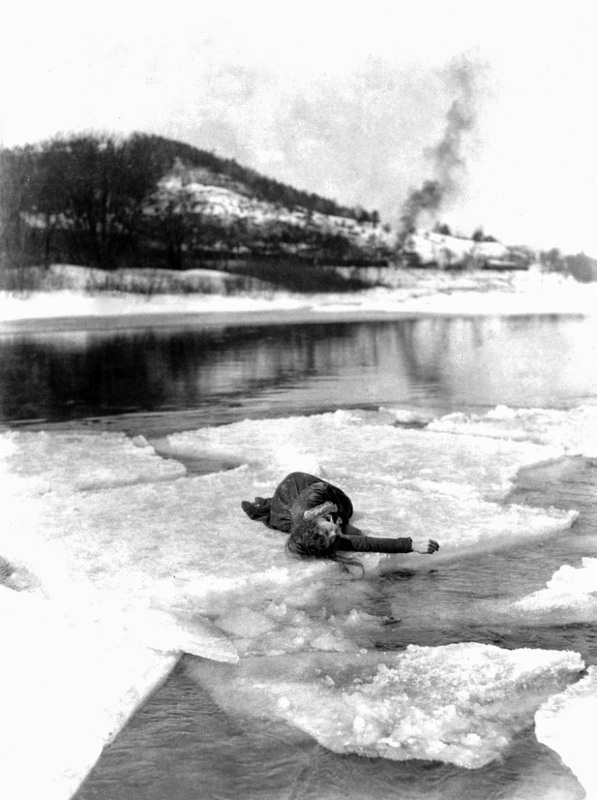 Not even Greta Garbo and John Gilbert in 'Love' (1927), to be screened on Sunday, Feb. 15 in Wilton, N.H., will create enough heat to rescue us from yet another impending snowstorm. What better day than Friday the 13th to ponder the fate of three separate screenings this Valentine's Day weekend, what with a severe blizzard expected to blow through our part of the world. Sounds like Old Man Winter and Mother Nature are having a little tiff. Well, as of now, all three screenings are still a go. I'll post updates if anything changes. • Saturday, Feb. 14, 2015, 9 p.m. 'Seven Chances' (1925) starring Buster Keaton; Aeronaut Brewing Co., 14 Tyler St., Somerville, Mass. Special Valentine's Day program at popular brew-pub in Somerville, Mass. Admission $10 per person. For details, check out their Facebook page at: https://www.facebook.com/events/845007065561871. Please note you have to be logged into Facebook to see this page. • Sunday, Feb. 15, 2015, 4:30 p.m.: 'Love' (1927) starring Greta Garbo, John Gilbert; Wilton Town Hall Theatre, Main Street, Wilton, N.H.; (603) 654-3456; www.wiltontownhalltheatre.com. Silent-era mega-stars (and off-screen lovers) Greta Garbo and John Gilbert heat up the screen in this 1927 adaptation of Tolstoy's novel 'Anna Karenina.' (Great if you forgot to do anything special on Valentine's Day.) Admission free, donations of $5 per person encouraged. • Sunday, Feb. 15, 2015, 10 p.m. or thereabouts, 'The Cabinet of Dr. Caligari' (1920); Somerville Theatre, 55 Davis Square, Somerville, Mass. ; (617) 625-5700; Somerville Theatre. Nearly a century after its release, the German expressionist film widely regarded as the world's first horror movie still has capacity to creep out audiences. Screened as part of the 40th Annual Boston Sci-Fi Film Festival's annual 24-hour science fiction film marathon, which runs noon on Sunday, Feb. 15 to noon on Monday, Feb. 16. Admission charged. For more info, visit the festival's Facebook page at https://www.facebook.com/BostonSciFi. So, about the blizzard: it's expected to roar into New England starting Saturday night, and then peak during the day Sunday before departing that evening. Hardest hit will be coastal areas, which includes the Boston area, where two of the three screenings are. Winds of 70 mph are expected, and maybe a foot to 18 inches of blowing, drifting snow. But of the two in Beantown, the Feb. 14 show at the Aeronaut Brewery takes place before the brunt of the storm moves through. As for 'Love' on Sunday at the Wilton Town Hall Theatre, I'd be surprised if that one doesn't happen, as interior New Hampshire will see a little less of the snow. And you can't stop love, right? Still, this could change. 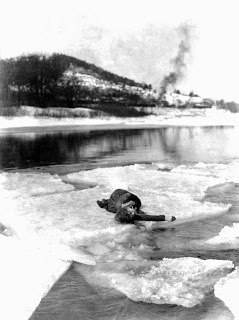 And that leaves us all in as much suspense as if we're watching a frozen Lillian Gish stranded on an ice floe heading for the falls. Will Old Man Winter or Mother Nature (or whoever is in charge of the weather) cause any of this weekend's screenings to be cancelled? I'll keep you posted. For now, here's the press release on the Valentine's Day screening of 'Seven Chances' (1925) at the Aeronaut Brewery in Somerville, Mass. I'll include info about 'Love' and 'Caligari' in separate posts. 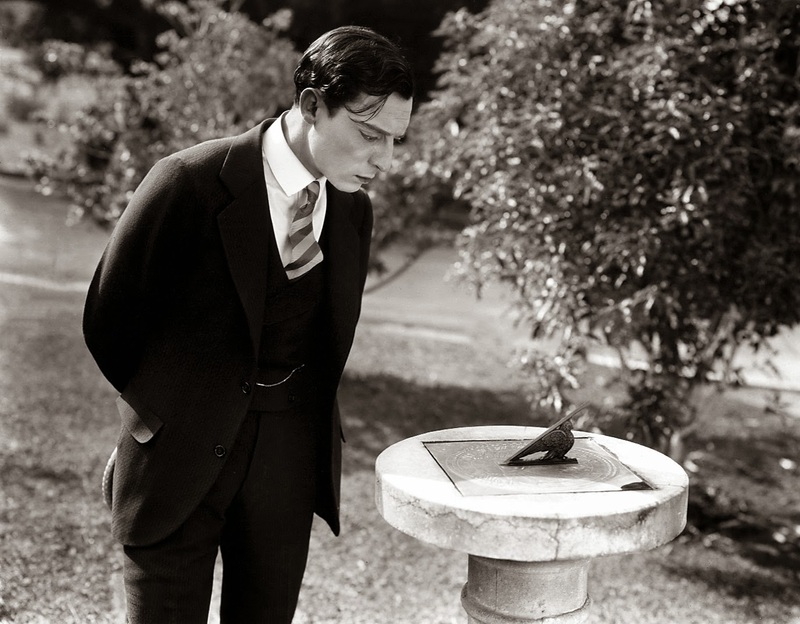 Buster checks the time, but he should also check the weather prior to a Valentine's Day screening of 'Seven Chances' (1925) on Saturday, Feb. 14 at 9 p.m. at the Aeronaut Brewery in Somerville, Mass. SOMERVILLE, Mass.—When words aren't enough to express those romantic feelings, why not let a silent movie do the talking? That's the thinking behind a Valentine's Day silent film program to be presented on Saturday, Feb. 14 at 9 p.m. at the Aeronaut Brewery, 14 Tyler St., Somerville. 'Seven Chances' (1925), a classic Buster Keaton romantic comedy, will be shown at the brewery with live music by silent film accompanist Jeff Rapsis. Admission to the screening is $15 per person. The program includes two shorter Keaton comedies in addition to 'Seven Chances,' one of Keaton's classic full-length feature comedies. "We envision our Valentine's Day event as a throwback to marvelous days of wonderment celebrating times together with friends and community," said Christine Platzek of Aeronaut, a craft brewery that opened in 2014. "If you can put all the original elements together, the films of early Hollywood still come to life," said Rapsis. "These are the films that caused people to first fall in love with the movies." Acclaimed for their originality and clever visual gags, Keaton's films remain popular crowd-pleasers even today. Keaton never smiled on camera, earning him the nickname of "the Great Stone Face." But his comedies rocked Hollywood's silent era with laughter throughout the 1920s. In 'Seven Chances,' adapted from a stage play, the story finds Buster learning that he'll inherit $7 million if he's married by 7 p.m. on his 27th birthday—that very day! Buster's hurried attempts to tie the knot on his own go awry, but then a newspaper story changes the game, creating an avalanche of would-be brides who relentlessly pursue Buster as he searches for his one true love before the deadline. 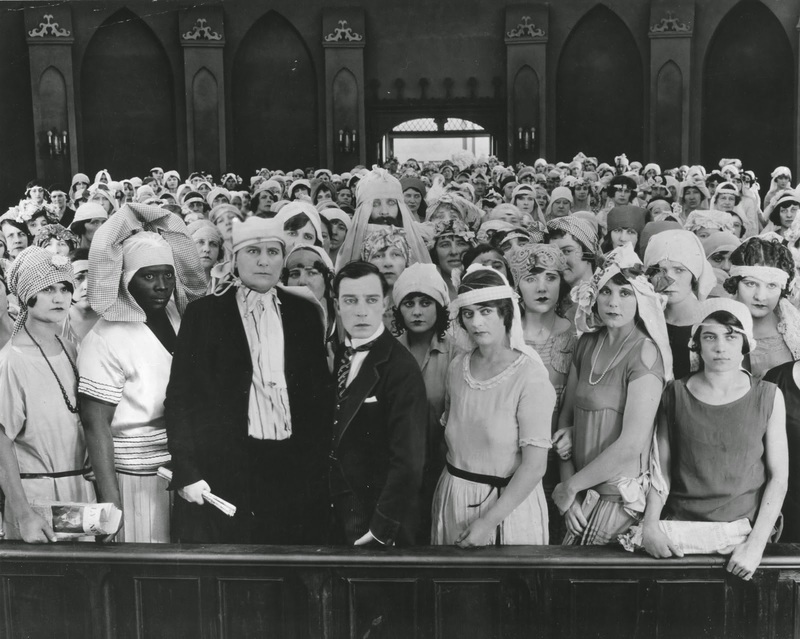 Buster and his would-be brides in 'Seven Chances' (1925). 'Seven Chances' was the first screen adaptation of the now-familiar story, since used in movies ranging from the Three Stooges in 'Brideless Groom' (1947) to Gary Sinyor's 'The Bachelor' (1999), a romantic comedy starring Chris O'Donnell and Renee Zellwinger. Keaton, along with Charlie Chaplin and Harold Lloyd, stands today as one of the silent screen's three great clowns. Some critics regard Keaton as the best of all; Roger Ebert wrote in 2002 that "in an extraordinary period from 1920 to 1929, (Keaton) worked without interruption on a series of films that make him, arguably, the greatest actor-director in the history of the movies." As a performer, Keaton was uniquely suited to the demands of silent comedy. Born in 1895, he made his stage debut as a toddler, joining his family's knockabout vaudeville act and learning to take falls and do acrobatic stunts at an early age. "We felt a vintage silent film program with live music would be a great way to create Valentine's Day memories that last a lifetime," Platzek said. "We encourage everyone to join us, whether you're on a date or on your own. We'll all end up laughing together!" The Aeronaut is also hosting a beer and cheese tasting event on Saturday, Feb. 14 at 5 p.m.
'Seven Chances' (1925) starring Buster Keaton will be shown on Saturday, Feb. 14 at 9 p.m. at the Aeronaut Brewing Co., 14 Tyler St., Somerville, Mass. Admission $15 per person. For more information, call (617) 987-4236 or visit the Aeronaut Brewing Co.'s Facebook page at https://www.facebook.com/aeronautbrewing/events. 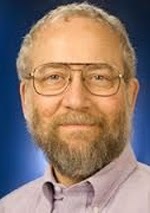 For more information about the music, visit www.jeffrapsis.com. Rin Tin Tin heats up the screen this weekend! It's true: Canine star Rin Tin Tin usually came across as more intelligent than his human co-stars. We've already got as much as five feet snow on the ground here, and more is supposed to fall this weekend. But it'll take more than mere snowflakes to stop Rin Tin Tin from racing across the Somerville Theatre's big screen on Sunday afternoon. Yes, we restart our monthly series of silent film programs at the Somerville on Sunday, Feb. 8 with a rip-roaring Rin Tin Tin double feature! The program starts at 2 p.m. and includes two crackerjack adventures starring everyone's favorite silent-era canine star. And trust me: these pictures really move. There's a reason Rin Tin Tin was among the most popular performers in silent film. 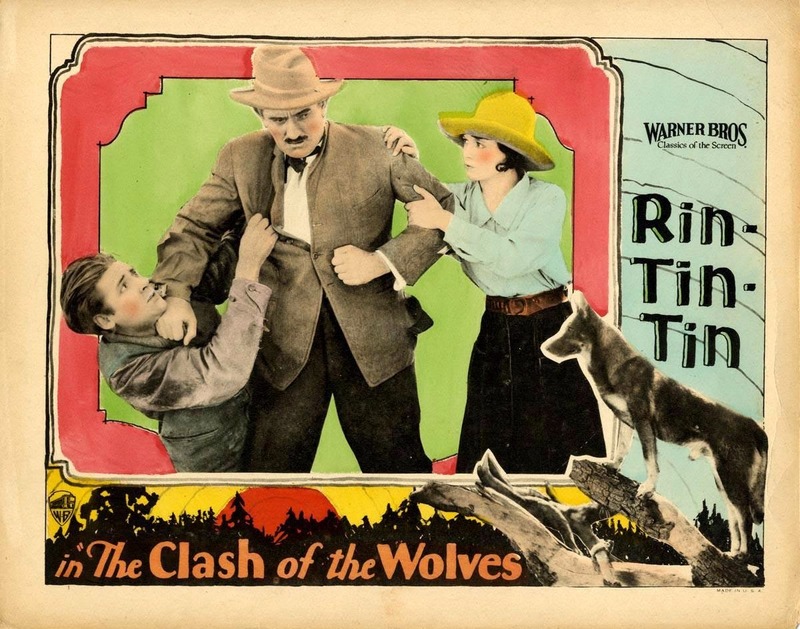 First up is 'Clash of the Wolves' (1925), a fast-paced adventure set out West in prospecting country. By the way, it's not the old West. The film is actually set in the current day, with Tin Lizzies and other features of then-contemporary life. But it's old now. And one of the joys of watching a film like this is to see what life was like in a great time of transition. They're both being shown via 35mm prints supplied by the Library of Congress, and with live music by me! Add in an audience and the Somerville Theatre's great vintage theater ambiance, and you have all the ingredients needed to resurrect the original excitement of the silent film experience. Even cat lovers will enjoy this program! More details in the press release below. Hope to see you at the Somerville this Sunday afternoon! SOMERVILLE, Mass. — He couldn't speak. But that was no handicap for a star during the silent film era. He was Rin Tin Tin, the legendary German Shepherd dog whose popularity rivaled that of any human performer when the movies were brand new. See for yourself on Sunday, Feb. 8 at 2 p.m., when the Somerville Theatre screens a double feature of vintage Rin Tin Tin silent adventure films in 35mm and with live music. 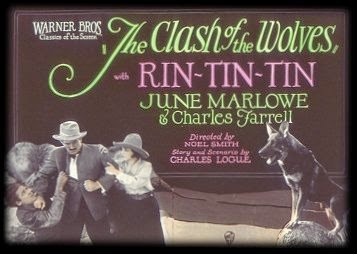 In 'Clash of the Wolves' (1925), Rin Tin Tin plays a wild wolf who befriends a prospector; together they hunt down a criminal intent on jumping the prospector's claim and stealing his girl. In 'The Night Cry' (1926), Rin Tin Tin is unjustly accused of killing sheep in ranching country; this forces him to flee for his life and hunt down the true killer on his own. Both films are rarely seen on the big screen now due to lack of availability of prints. For the Feb. 8 program, the Somerville is making use of restored 35mm prints on loan from the U.S. Library of Congress. Both melodramas were produced by then-struggling Warner Brothers and proved immensely popular around the world, with audiences marvelling at the then-new German Shepherd breed's feats of derring-do as he often out-smarted his human co-stars. At the time,studio executives referred to Rin Tin Tin "the mortgage lifter" because the dog's pictures helped rescue the ailing studio from bankruptcy. 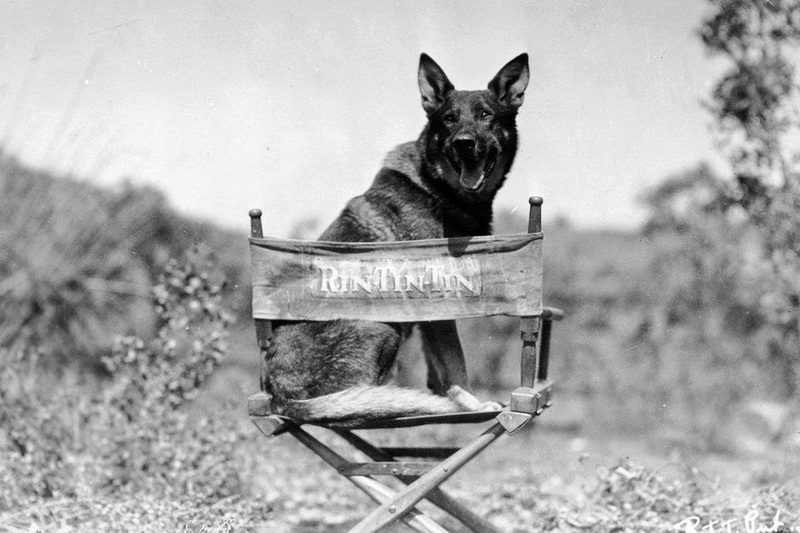 Rin Tin Tin was so popular, he was named "Best Actor" at the first-ever Academy Awards in 1929 until ceremony officials decided on a re-vote in favor of human performer Emil Jannings. Both films at the Somerville will be accompanied live by silent film musician Jeff Rapsis, who uses a digital synthesizer to recreate the texture of a full orchestra. 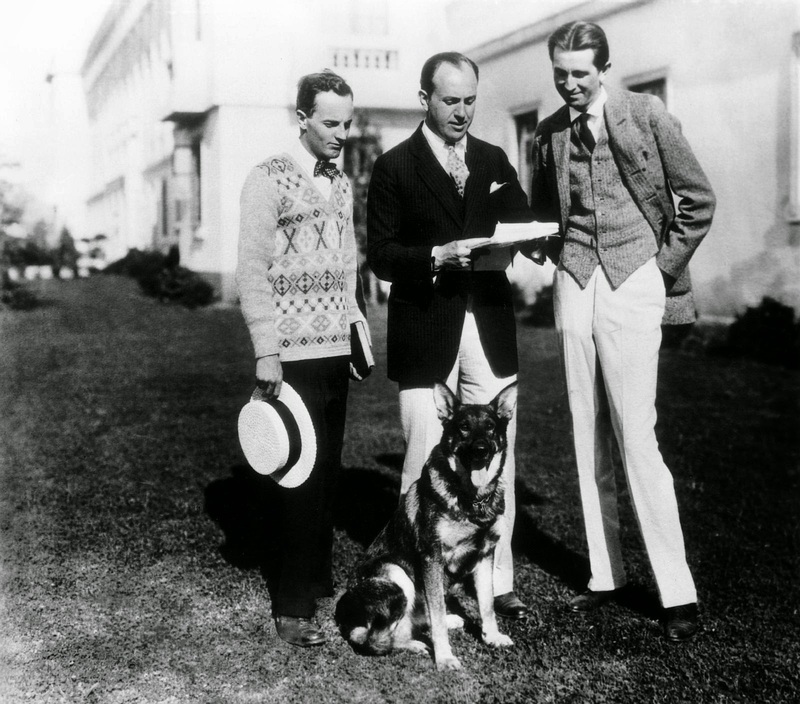 "The Rin Tin Tin films are great pictures for audience reaction, even today," Rapsis said. "They're full of fast-paced action, great stunts, and above all they really move!" "If you're new to the silent film art form, seeing the Rin Tin Tin pictures in a theater with live music is a terrific way to get acquainted with the enduring power of this kind of movie-making," Rapsis said. Our canine hero attends to some important studio business. Rin Tin Tin remained popular throughout the silent film era and until his death in 1932, which made headlines around the globe. But his progency went on to star in later films and TV shows, keeping the name before the public for generations. Rin Tin Tin's descendants are still bred, continuing the bloodline to the present day. The ongoing Rin Tin Tin phenomenon inspired a recent book, "Rin Tin Tin: The Life and the Legend" by New Yorker writer Susan Orlean. 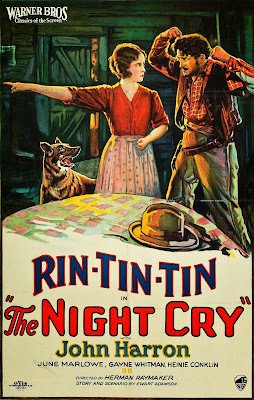 The Rin Tin Tin double feature opens the Somerville's 2015 "Silents, Please!" 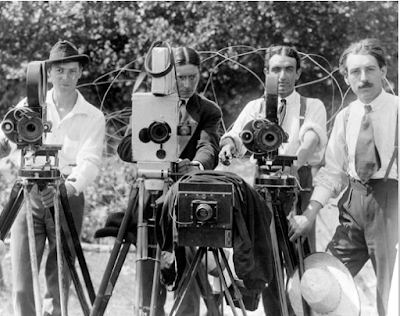 program, which aims to recreate the silent film experience as early movie audiences knew it. Each month, the Somerville Theatre will screen a silent film program in the facility's 900-seat main theatre, always in 35mm and with live music. "These are the films that caused people to first fall in love with the movies, and they're also part of our theater's heritage," said Ian Judge, general manager of the Somerville, which celebrated its 100th birthday last year. "When you put the silent film experience back together, it's amazing how the movies jump to life," Judge said. "You can really get a sense of why people got so excited about movies when they were new." • Sunday, March 8, 2015, 2 p.m.: 'A Silent Surprise: W.C. Fields Double Feature.' Long before his nasal twang resounded throughout movie theaters, a younger W.C. Fields had a very successful career as a silent film actor. In 'Sally of the Sawdust' (1925), Fields plays a circus con artist who adopts an orphan (directed by no less than D.W. Griffith! ); 'Running Wild' (1927) finds Fields as a hen-pecked husband who turns to hypnosis to assert control in his household. • Sunday, April 5, 2015, 2 p.m.: The original 'Ten Commandments' (1923). Long before Charlton Heston played Moses in Technicolor, director Cecil B. DeMille filmed this silent blockbuster on a grand scale. Many say it surpasses the remake! See for yourself, on Easter Sunday, in a 35mm print provided by the Library of Congress. 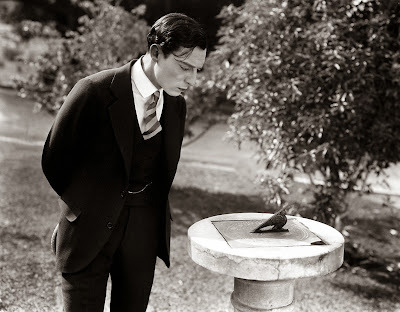 • Sunday, May 3, 2015, 2 p.m.: 'The Cameraman' (1928) starring Buster Keaton. Stone-faced Buster attempts to impress the girl of his dreams by becoming a glamorous newsreel cameraman, with disastrous (but hilarious) results. A classic comedy from the peak of the silent film era. • Sunday, June 7, 2015, 2 p.m.: 'Show People' (1928) starring Marion Davies, William Haines, directed by King Vidor. A young woman tries to break into the movies as a dramatic actress, but can only find work as a pie target in slapstick comedies. Director King Vidor's insider valentine to silent-era movie-making is packed with eye-popping cameo appearances of everyone from John Gilbert to Charlie Chaplin! Plus warm-up comedy 'Play Safe' (1927) starring Monty Banks, with what's regarded as the greatest train chase sequence of the silent era. • Sunday, July 5, 2015, 2 p.m.: 'The Big Parade' (1925) starring John Gilbert, Renee Adoree, directed by King Vidor. Sweeping World War I saga about U.S. doughboys signing up and shipping off to France, where they face experiences that will change their lives forever—if they return. A double feature of silent-era Rin Tin Tin adventures will be shown in 35mm and with live music on Sunday, Feb. 8 at 2 p.m. at the Somerville Theatre, 55 Davis Square, Somerville, Mass. Tickets are $15 per person, with discounts for students and seniors. For more info, call the theater at (617) 625-5700 or visit www.somervilletheatreonline.com. For more info on the music, visit www.jeffrapsis.com. Labels: Clash of the Wolves, Jeff Rapsis, Rin Tin Tin, Somerville Theatre, The Night Cry, Warner Bros.
We're digging out from three feet of snow in this part of the world. But the show must go on! And how fitting that the show last Tuesday night was 'Nanook of the North' (1922) at the Manchester (N.H.) City Library. A few dozen hardy souls braved the enormous snowbanks and we had a great screening. My big joke was my answer to the commonly asked question, "How are the roads out there?" "The roads are fine. It's the other drivers that cause all the problems!" 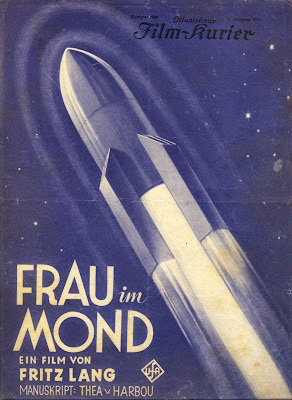 • Two separate screenings of Fritz Lang's neglected late silent 'Woman in the Moon' (1929) really connected with audiences. I had planned these deliberately to get the silent film part of my brain restarted after climbing Mount Kilimanjaro. And it worked: I love doing this film, and both times the score came together fairly easily, even if it's a big and ambitious film. Anyway, it was enough to get the rust out and get back into the "silent film accompaniment" zone. One of the tricks of this film, incidentally, is to limit the accompaniment to strings only for the first 90 minutes or so—up to the big launch sequence. The only exception is using a loud bell and whistle as sound effects during an early flashback to a university lecture, and then a breathy voice/organ sound for when we see footage of the moon shot from a probe. Otherwise, all strings. This creates a great impact when you switch to full orchestra starting with the launch sequence, which is quite powerful filmmaking, including the first-ever appearance of a "countdown" prior to something blasting off, which was apparently the invention of Lang and his collaborator, Thea von Harbou. However, I think the exciting sequence leading up to the crash landing on the moon's surface is also first-rate. With the right kind of music, it build to a tremendous climax—so much so that at both screenings, spontaneous applause broke out when it concluded. A great film that I love doing. • This past Saturday, I took my now-annual trip out to Liberty Ridge Farm in Schagticoke, N.Y., a rural community about a half-hour north of Albany. There, we had the sixth annual "Dead of Winter" community get-together pot luck and silent film night in the farm's very handsome function hall. This has been going on so long, and with most of the same people attending each time, that I now getting updates on the health of family matters and other personal concerns. Which I love. I also love that the audience is made up of all ages: from kids in elementary school to people old enough to actually remember when silent movies were new. I'm not kidding: one lady was 94 and able to recall details from her childhood experiences at the local bijou. 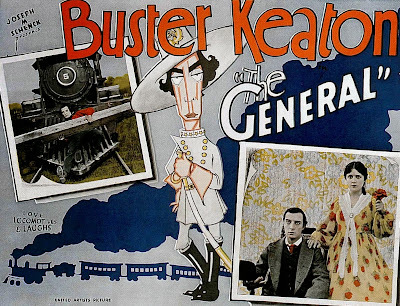 We ran Keaton's 'The General' (1927) and audience reaction was strong. But the highlight for me, truth be told, was someone's casserole dish, which was topped with french-fried onion rings. While in the buffet line, when no one was looking I selfishly scooped a large portion of fried onions off the top of the dish. Pure heaven! I could make a whole meal out of those if my cardiologist would allow me. • One of the great things about doing silent film screenings is that you get to go to places you otherwise never would have got to. For instance: after doing music for 'Nanook of the North' at the Harvard Film Archive, I ventured out in search of the Aeronaut Brewery, a place I'd never heard of but located not too far away. The folks there were interested in a Valentine's Day silent film event, so I wanted to check the place out. Driving slowly through the snow-clogged streets of Cambridge, I seemed to be entering an old industrial area. Did I have the address right? I turned onto Tyler Street, which was all loading docks and chain link fences. By some miracle, I found a parking space carved out of a 10-foot-high snowbank. Snow was blowing off roofs like it was the Klondike. But I walked up the street, which continued between what seemed to be two abandoned warehouses. I could hear noise coming from inside the buildings, but with the wind howling I wasn't sure if it was just my imagination. I finally got almost right in front of a pair of steamed-up glass doors when I could make out the name: "Aeronaut Brewing." So I walked inside, and entered an alternate world that completely surprised me. Get this: The place was an enormous high-ceilinged warehouse packed with people, most of whom seemed half my age or younger. Hanging overhead from the ceiling were collections of lawn chairs and balloons—apparently that kid who took a ride using similar equipment is the inspiration for the name. Off to one side, people were lined up several layers deep at an enormous beer bar. And in back, where the brewing tanks were located, I found a guy with a laptop who turned out to be co-owner Ben Holmes. Ben happens to be married to Christine Platzek, who plans events at Aeronaut and contacted me about the silent film. Christine gave me a tour of the place, which sprawls through several connected industrial spaces. In addition to customers, at least two bands were jamming in odd corners, including one with a sousaphone. Food is not yet available, but an enterprising guy was reselling Union Square donuts. For the silent film, Christine wanted me to set up in an area on the far side of the facility (to cut down on the cross-traffic) with a big white wall. The place had a wonderful vibe and I immediately wanted to try doing a show there. So yes, we're doing a Valentine's Day program on Saturday, Feb. 14 at 9 p.m.
Christine and Ben then treated me to one of their best available: the Union Square IPA. It was fantastic. I would have tried more if I didn't have to drive back to New Hampshire afterwards. What really made it worthwhile, though, was at one point I ended up standing behind the bar talking to Christine, and customers started asking me questions. When it was apparent that I was clueless, Ben stepped in to explain that I was going to do live music for a silent film program there on Valentine's Day. "Wow," gushed a young woman in line, looking right at me. "That's really awesome." Hey, you know how a dog is supposed a great way to get women to talk to you?